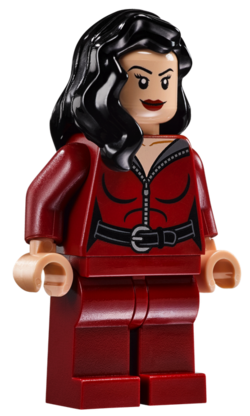 Talia Al Ghul is a minifigure released in 2016. She first appeared as a video game character in the DS version of LEGO Batman: The Videogame and later the portable version of LEGO Batman 2: DC Super Heroes. Talia's hair is long, and black, previously used on Professor Dumbledore and Poison Ivy. Her face is also similar to Poison Ivy's with a stern expression, but her eyebrows and lips are a darker colour. She wears a white, long-sleeved shirt with is opened to show a bit of her chest and is decorated with a few creases. She wears black pants and is armed with a sword. For LEGO Batman 2, Talia was redesigned with a more recent hairpiece. It is once again coloured black, but is now more lively. It is wider, and flows down her back and has a strand over each of her shoulders. This hairpiece is also used on Elizabeth Swann, Syrena, Vampyre Bride, and The Mermaid. Her visage is still stern, but has more unique eyebrows which are still black and pointed downwards. Her lips are now coloured dark red. She now wears a tighter, black suit with about the same amount of chest showing at the top. There is a zipper running from where the chest stops showing down to the bottom, where it is covered by her grey belt. The zipper handle is circular and dark grey. Talia's arms and legs are also black, while her hands are grey. She is able to use acrobatics, sharpshooting, and stealth abilities. Talia is the daughter of the Eco-terrorist Ra's Al Ghul. Her father wants Batman to marry Talia and become his heir. Though Batman has no interest to become his heir, he does show attraction to Talia. During her time with Batman, she became pregnant and gave birth to his son, Damian Wayne. Without Batman knowing, she secretly raised him before giving him back to Batman as a ploy to distract him. Talia is an unlockable character in the portable versions of LEGO Batman: The Videogame. She is also mentioned on consoles with the Batcomputer. It confirms her to be Ra's daughter who is in love with Batman, but her loyalty to her father keeps them apart. Talia also plays no role in LEGO Batman 2, but is an unlockable character in the portable versions of LEGO Batman 2: DC Super Heroes. Her minikit can be found in the level Assault the VTOL. She costs 100,000 studs. Facts about "Talia Al Ghul"
This page was last edited on 25 June 2016, at 09:17.